Caesar's Challenge Monday 23rd July :: Gerrards Cross Golf Club is considered one of the most attractive courses in South Buckinghamshire. On a blazing hot Monday 23rd July, 54 members participated in this fun competition which was returning after its one year break. 18 teams of 3 fought it out for generous team prizes and individual glory. Fortified with water, chocolate and fruit a very, very close competition ensued with nearly all of the final results being decided on countback. The Seniors were delighted to welcome a sizeable representation of Ladies to the field. A good day for them as 7 from a total of 14 prizes were presented to Ladies. A special mention regarding the Individual competition, John Ketley successfully defended the title and retains the trophy, he won on count back from Vicky Brown with 37 points. All participants and helpers a enjoyed a sociable post-match lunch with 3 teams accommodated on each table. After lunch Ladies' Captain Carol Derbyshire presented the generous selection of prizes. £280 was also raised for the Scannappeal charity – surely the bargain event of the year. Seniors' Sec. Laurie Batten thanked everyone for taking part in such hot weather, he also offered best wishes on behalf of all present to Seniors' Captain & President, James Torr who could not attend due to ongoing medical treatment. 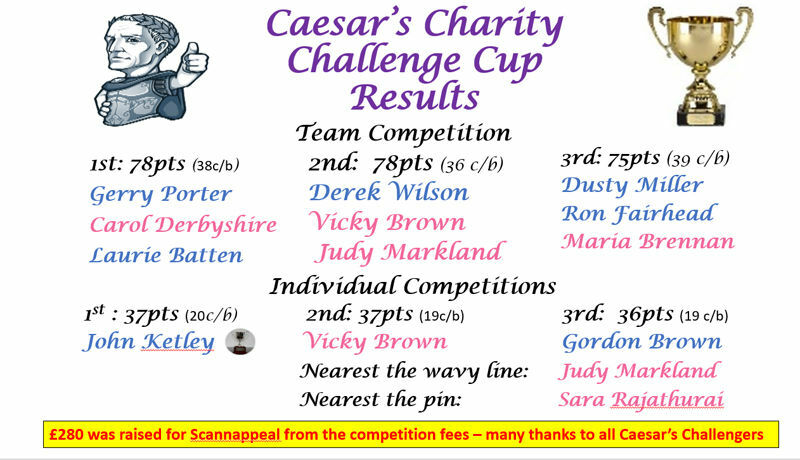 Well done all Caesar’s challengers and the event support team: Raymond Hunter, Laurie Batten ,Tim Lawrence & William Forest. We look forward to an even bigger event next year.